The tall graceful habit of this annual makes it an attractive background in your flowerbed. It grows about 3' tall and has small yellowish flowers from summer until fall. Host plant to the Black Swallowtail caterpillar. Propagation: Seed or small plants. I prefer seed, because dill has a taproot, and could be hard to transplant. Soak seeds 24 hours then germinate in damp paper towels and zip lock baggies. Or sow directly in the garden after your last frost date. Make a second planting in early July for a continuous supply. Soil and Fertility: Well drained, moist soil of high fertility, pH 5.5-6.7. Dill repels the tomato hornworm, and cabbage moths. If you want to keep these critters out of your veggie garden, plant dill around these plants. The clusters of tiny flowers attract bees and other beneficial insects to the garden. Don't cut the flower head off - allow it to set seed and it will self sow. 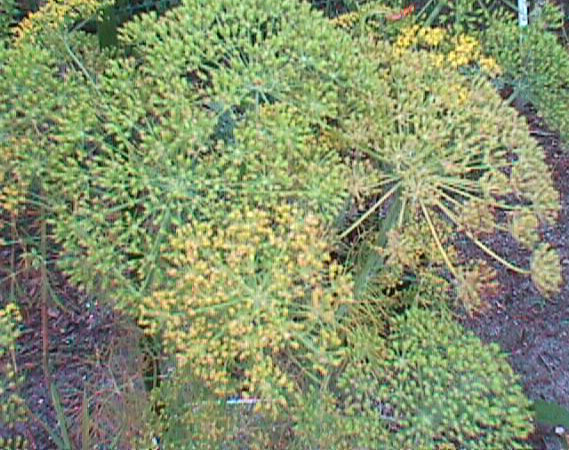 Dill will sometimes cross-pollinate with fennel if planted close to each other. I don't think this is necessarily a bad thing in the butterfly garden, because both dill and fennel are host plants.